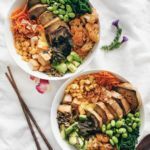 Winter is here, but luckily, our Instagram community are here with a selection of warm and nourishing recipes to keep us healthy through the cooler weather! Thank you to our Instagram community for sharing and keeping us inspired into the cooler months. 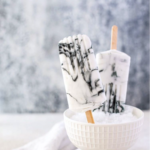 Getting creative with Cocobella in the kitchen? 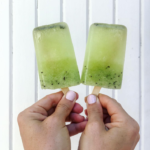 Please don’t forget to tag @purecocobella and #cocobellarecipe, we love seeing what you’re up to! 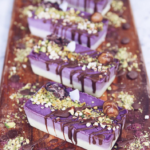 If you can’t go past a delicious desert, you’ll definitely want to save the recipe for these raw vegan bites. Add all crust ingredients into a blender or food processor. Process on a low speed until the almonds and coconut release their natural oils, and form a mixture that sticks together. Press the mixture into the bottom of the moulds and place into the fridge. In the meantime, add all filling ingredients except for the matcha into a blender. Blend on low and gradually increase the speed once mixture begins to break down. Blend until you’re left with a smooth, lump-free and creamy batter. Pour the batter into the moulds, leaving space for the matcha layer. Place onto a tray and allow mixture to set in the freezer. You should have around half the mixture left-over. 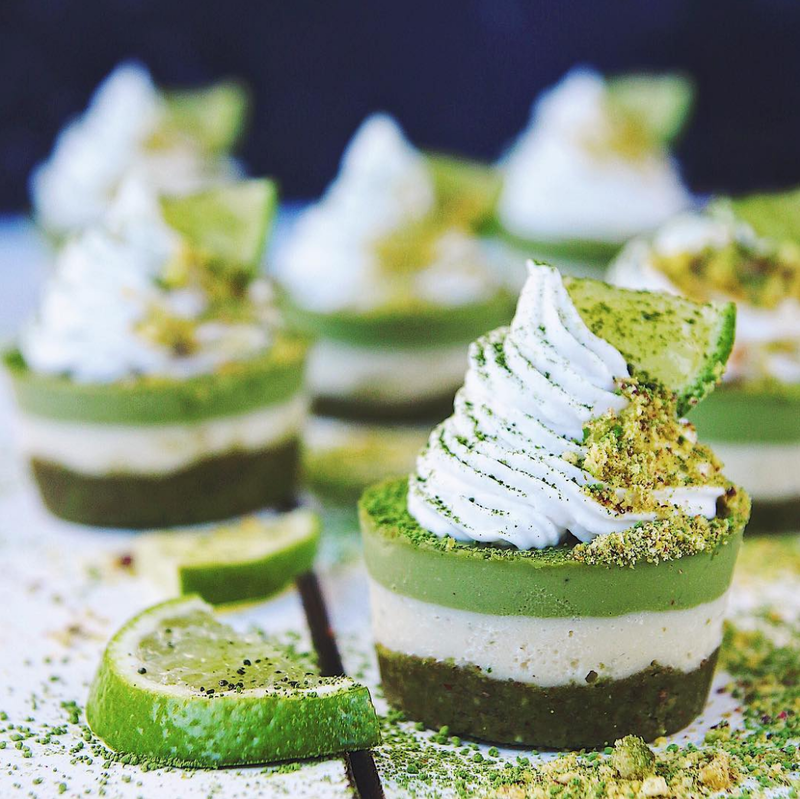 Once first layer has set, add the matcha into the remaining cheesecake batter and blend. Pour to fill the moulds and place into the fridge. When the cheesecakes are set, decorate and enjoy! Crispy falafels that are baked, not fried… it doesn’t get much better! You can omit the wraps and enjoy this as a salad too. For the falafels, rinse dry chickpeas under water for 10 seconds. Add chickpeas to a medium sized pot and fill it with filtered water until just covered. Place pot over high heat and bring to a boil. Boil for 2 minutes then remove from heat. Keep it covered and let sit for 1 hour. Preheat oven to 200°C. Line a baking tray with parchment paper and set aside. Once chickpeas have set for the 1 hour, drain and set aside. In a high-speed food processor, add onion, garlic, parsley and rosemary, pulse on high until onion is diced. Add the drained chickpeas to the processor with the onion mixture and add in the almond meal, cumin, turmeric, paprika, salt and pepper. Blend on high for 1-3 minutes or until chickpeas are broken up well, scraping down the sides as needed. The chickpeas should look like tiny chunks up close after blending. The mixture must hold it’s shape when formed into balls. Keep blending until you reach this consistency. Form mixture into round, slightly flattened falafel balls, approx. 3-4 tablespoons worth per falafel. Place on prepared tray and repeat this method with remaining mixture. 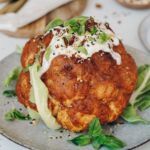 Bake for 20 minutes, then flip each falafel over, bake for a further 10 minutes or until lightly golden. Whilst falafels are baking, begin the vegan tzatziki. In a medium sized mixing bowl, combine all tzatziki ingredients, mix until well combined. Set aside. Once falafels are ready, remove from oven and leave on tray. 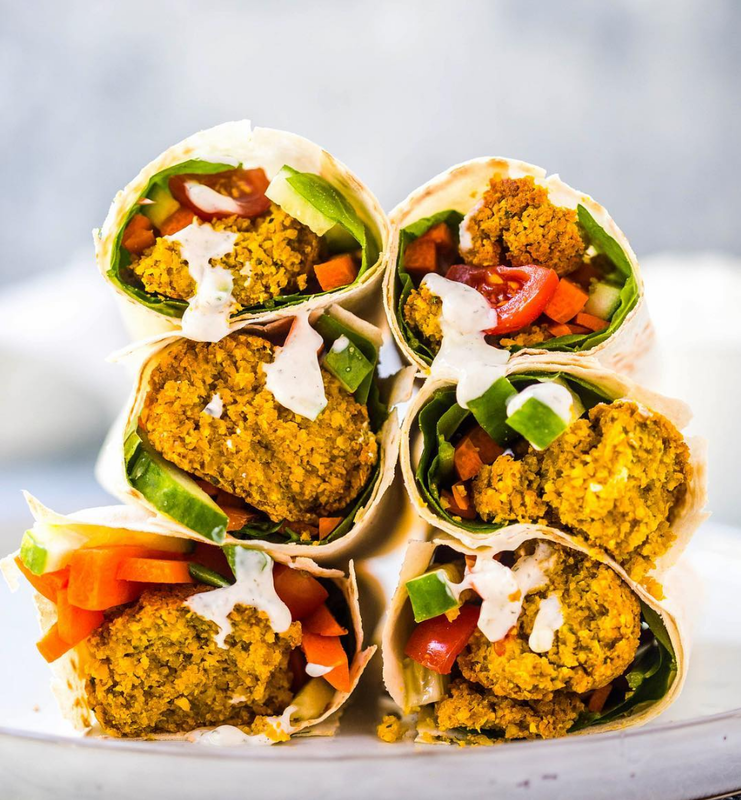 Prepare wraps by filling each wrap with desired amount of fillings and add a couple of falafels in each wrap, you can also cut them in half and then add them into the wrap. Drizzle over vegan tzatziki. Slice in half and enjoy! 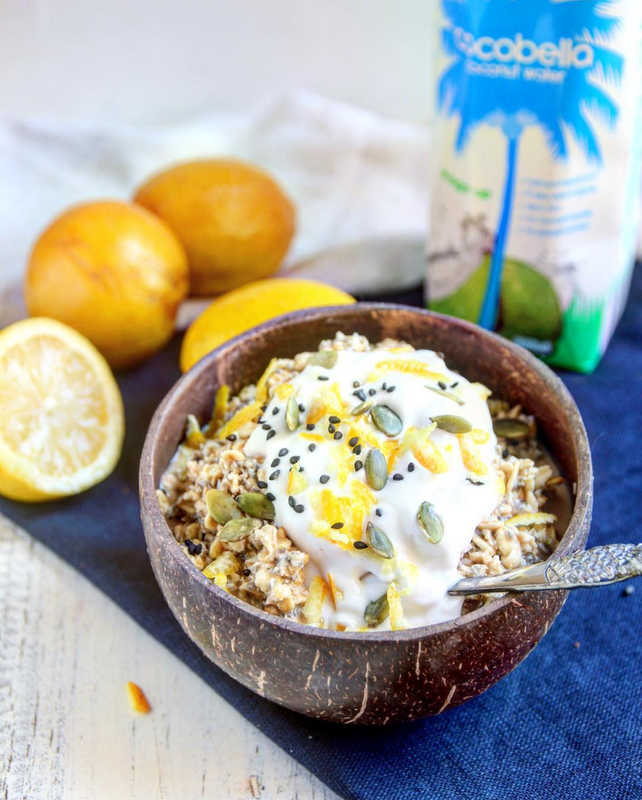 Add a little zest to your morning with this easy, tropical flavoured Bircher Muesli. Simply combine all ingredients and top with Cocobella coconut yogurt and lemon zest. Yum! Breakfast inspiration that is surprisingly easy to make. Whip this recipe out on a Saturday morning to impress your pals. Preheat waffle iron to medium heat. Mix waffle ingredients together in large bowl until well combined. Pour into waffle iron and leave for 4-5 minutes, or until the edges start to brown. 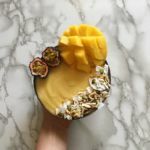 Blend Pitaya Nicecream ingredients together in a high powered blender until smooth and creamy. Add more coconut water if your mixture is too thick. 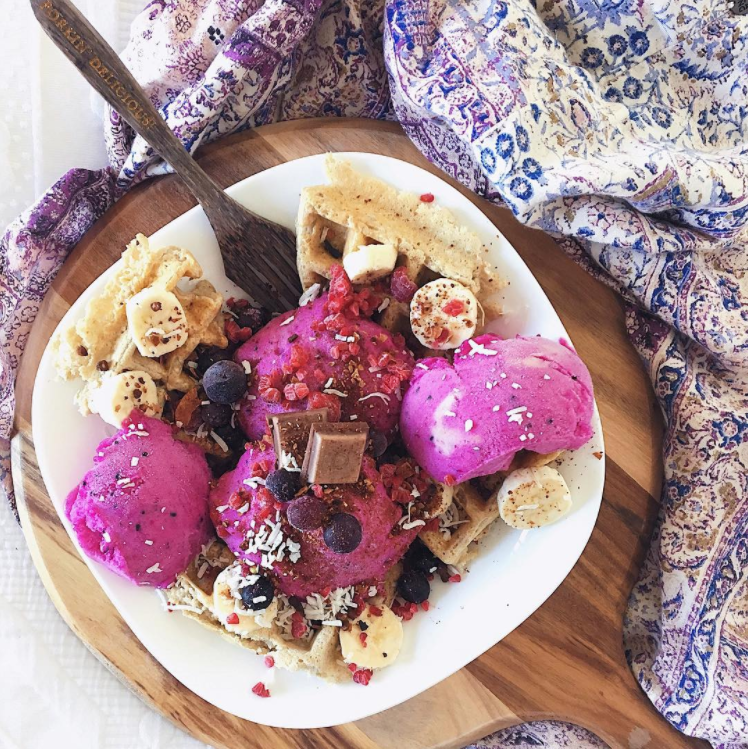 Top waffles with Pitaya Nicecream, frozen berries, banana and maple syrup. Enjoy! 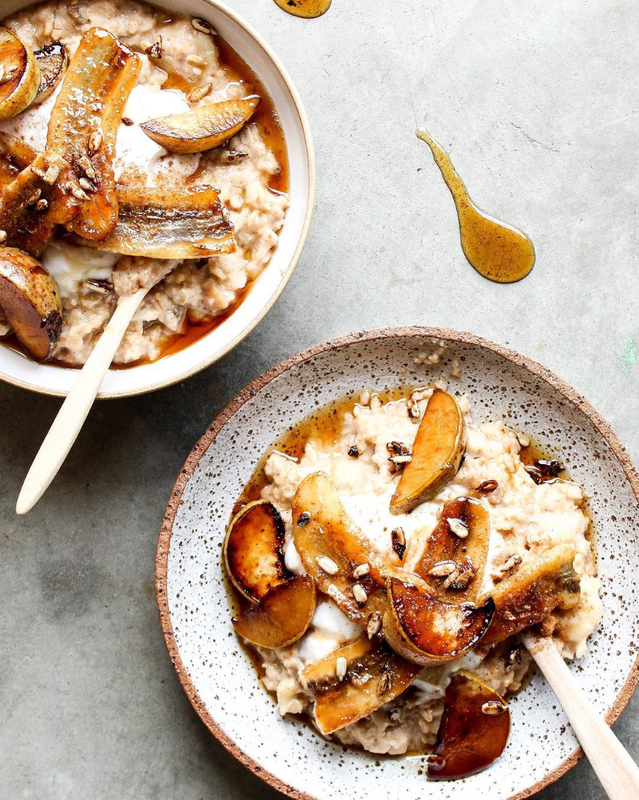 Start your day with this warming winter breakfast treat. Combine the oats, milk, water, cinnamon, vanilla and chopped banana in a saucepan and heat on low-medium for 5-8 minutes, stirring often until liquid is absorbed. Pour into bowls. Add pear, banana & pecans to a non stick pan, sprinkle over coconut sugar. After 45 seconds carefully flip and cook the other side for an additional 30 seconds. Remove from heat and place on top of your porridge. Finish with Cocobella Coconut Yoghurt and a drizzle of maple!